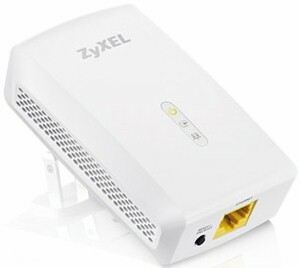 While we await the first HomePlug AV 2 MIMO adapters, ZyXEL has released its PLA5206 1000 Mbps Powerline Gigabit Ethernet Adapter. Like many powerline adapters, the new ZyXEL is available only in a kit of two as the PLA5206KIT, which will currently run you about $130. Let's establish right away that this is not an AV 2 MIMO adapter. Using official HomePlug AV 2 Profile nomenclature shown below, the PLA5206 supports the SISO 750 Mbps profile (SISO-750 for short). This is clearly a theoretical calculation of raw bit rate, which will never be reached in real world use. It also begs the question of why the "official" AV 2 profiles have the numbers they have. But they are what they are. Since I'm a fan of standards, I'll be using the profile nomenclature in the above table going forward to identify these products in our Charts, Finders and other product research tools. The PLA5206 is larger than most HomePlug adapters I've seen lately. But the two-prong plug placement positions the adapter body so that it won't block the adjacent outlet in a standard U.S. duplex, as shown in the photo below. The serial number label specs a 100 - 240 VAC operating range. The callout diagram below shows the adapter supports tri-color HomePlug link quality indication. The single Gigabit Ethernet port is centered on the bottom side of the adapter, with the Reset / Encryption button sitting to its left as shown in the opening product shot above. The User Guide says the adapter goes into power-saving mode after 60 seconds of Ethernet inactivity and powers up again when activity resumes. I verified this by the following procedure, which ran without a hitch. Waited until the Ethernet unplugged PLA5206 entered power-save. Broadcom has been largely absent from the HomePlug market, despite buying Gigabit powerline pioneer Gigle back in 2010. The only other Broadcom-based powerline products we've tested were Linksys' PLE400 and PLS400 back in 2012. So the ZyXEL PLA5206 is a HomePlug AV2 coming-out party of sorts, since it uses Broadcom's BCM60333, which the company announced over a year ago. The inside photo clearly shows the BCM60333, which is coupled to the sheet-metal thermal spreader in the top cover via the thermal pad stuck to the spreader. The small device below the BCM60333 is a Microsemi Le87401 PLC Single Channel Line Driver designed for use in HomePlug AV2, G.HN and MoCA devices. It's interesting to note that the Broadcom device fills a hole in QCA's product offerings, shown in a table borrowed from the HomePlug AV2 Head-to-Head. The User Guide references a PLA Series Configuration Utility. But it wasn't included on the CD in the box that contained only documentation and wasn't found via Support searches for either PLA5206 or PLA Series Configuration Utility. I tested the PLA5206 using our standard powerline test procedure, with all results entered into the Powerline Performance Charts. I pulled all AV2 SISO adapters tested so far, i.e. TP-LINK's TL-PA6010, Linksys' PLEK500 and ZyXEL's PLA5205, into the three location comparison plots below. All except the PLA5206 are AV2 SISO-500 devices, using QCA's QCA7450 / AR1540 chipset. The Downlink Throughput plot below shows the PLA5206 having the highest throughput only in my worst-case Location E. The TP-LINK TL-PA6010 has the highest best-case (Location A) downlink throughput of 267 Mbps vs. the PLA5206' 201 Mbps. Uplink is a different story with the PLA5206 turning in the highest Location A throughput of 279 Mbps! But the TL-PA6010 isn't far behind with 263 Mbps. The simultaneous up /downlink IxChariot plot for the PLA5206 shows a huge mismatch in the two directions, with a definite preference for uplink (transmit) traffic. At least total throughput is up a bit to 308 Mbps. Adding more simultaneous streams doesn't add much to total throughput. With two up/downlink streams running simultaneously, total throughput is only 327 Mbps, with the up / downlink imbalance still obvious. Broadcom told me that their devices perform line condition adjustments during the first 10 seconds of steady traffic. They also said the devices do a lot of adaptation to work around noise. So I did some quick tests in Location E, where most of my worst powerline noise sources (our smartphone and tablet chargers) live. The tests were similar to those run on the TP-LINK TL-PA6010, basically plugging and unplugging a particularly noisy wall-wart while an IxChariot stream was running, and seeing what happened. The composite plot below shows the baseline Location E downlink test, run with all noise sources unplugged. Also shown is a test that starts the same way, then has a noise source plugged in around 18 seconds in, then uplugged at the 30 second mark. Sure enough, throughput recovers to the initial value within 30 seconds. I also ran a two minute torture test with all noise sources plugged in to see how the adapter would cope. I started by unplugging the adapter to clear any previous adaptations, plugged it in and let it link, then started the test. There's an initial adjustment at the 10 second mark, just as Broadcom said. But there's also a very slow increase in throughput of about 5 Mbps average over the two minute test, by my eyeball. This is certainly a welcome addition, but nothing to write home about. There's not much sense using the Powerline Ranker to sum up, since the PLA5206 currently stands alone in its AV2 SISO-750 class. So let's look at the Powerline Charts' average down and uplink values for all AV2 SISO products. For downlink, TP-LINK's TL-PA6010 is the clear choice with 17% higher average throughput than the PLA5205. For uplink, the two products are tied. Pricewise, however, the TP-LINK has a huge price advantage at only $73 vs. ZyXEL's $129. Bottom line, despite ZyXEL's much bigger "number on the box", TP-LINK's TL-PA6010KIT still seems the clear choice if you need a pair of HomePlug adapters today.